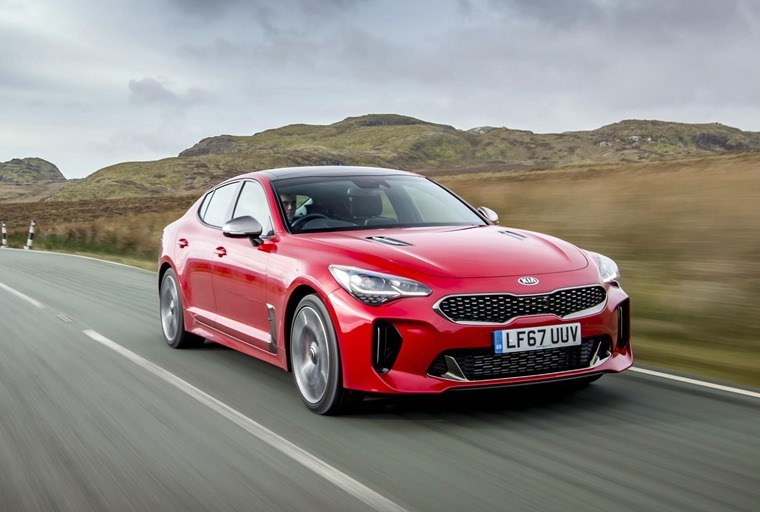 A bold statement of intent and a viable rival to the likes of the BMW 4 Series Gran Coupe and Audi A5, the Stinger is everything you like about Kia wrapped up in a package that’s genuinely exciting and great looking. Sensible family cars, that’s what Kia makes. The brilliant little Picanto, the excellent Sportage, the superb Sorento. They all do the job well, but there’s not much to get really excited about, as even the ‘hot’ models are barely more than room temperature. However, all that is changing. Some years ago, Kia headhunted Audi’s Peter Schreyer, the man responsible for the Audi TT, and what followed led to some more daring design from the brand. Now it’s backing up that design expertise with engineering know-how from BMW M Power chassis expert Albert Biermann, who was lured to Kia after 30 years of playing with M3s and M5s. Yep, there’s brawn to back up the beauty. Balance, too. Their first project together? A grand tourer capable of rivalling anything from Munich or Ingolstadt - the Stinger. As a statement of intent, it’s a pretty bold one. Eschew all you know about workaday cars and send the boys to work on a sleek four-door coupe that’s powered by a 3.3-litre twin-turbo petrol V6. I’m in. Schreyer’s gone to town on the bodywork, creating a long, sweeping coupe-like shape that takes up far more tarmac than a BMW 4 Series Gran Coupe, and ignores the rather derivative designs coming from the German rivals. 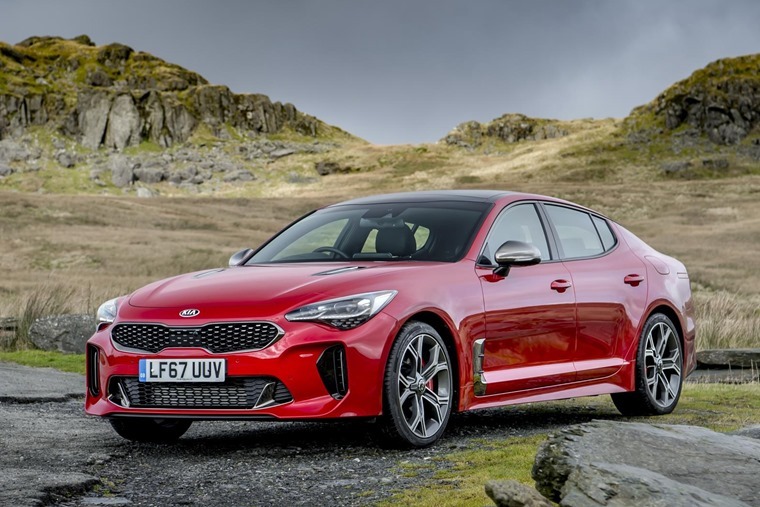 Instead Stinger forges its own design path and, while it might not be readily identifiable as a Kia by the public at large yet, it’s unlike anything else on the road. In a world of downsizing, low CO2 emissions and economy-chasing technologies, the Stinger’s 3.3-litre petrol engine is refreshing. There’s 365bhp on tap that translates to a 0-62mph dash of just 4.7 seconds - marginally quicker than a Bentley Continental GT, to give that some context - and will plough on to a maximum speed of 168mph. Yep, there’s brawn to back up the beauty. Balance, too. There’s no disguising the Stinger’s significant weight - it’s long, wide and heavy - but the car handles curves with a degree of enthusiasm. The steering, while lacking any kind of feel, is precise while the front end is sharp enough to make placing the car easy. The power goes to the rear wheels, helping the balance and poise of the car, but press the throttle too hard and the back end will come swinging round in a cloud of tyre smoke as the limited slip differential keeps both wheels lit up. 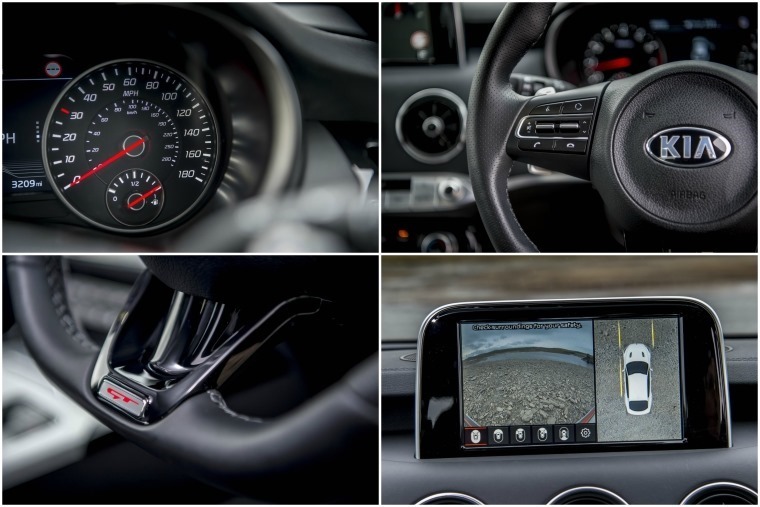 There’s also a clever ‘Smart Mode’ that monitors your driving and automatically switches between Eco, Comfort and Sport. The long wheelbase makes managing any errant slides easy enough, but the sheer bulk of the car makes roads feel very narrow indeed when all four wheels aren’t necessarily pointing in the right direction. It’s a surprise that Stinger has been engineered to be so tail-happy as that could get some drivers into serious problems, but it could just be down to damp roads and near-freezing temperatures during this test. There are electronic aids to help keep the car on the straight and narrow, with a variety of settings providing more or less assistance. There’s also a clever 'Smart Mode' that monitors your driving and automatically switches between Eco, Comfort and Sport. Stinger’s cabin is a fine example of simple, elegant design. Naturally sceptical of this at first, it actually works rather well; you remain cosseted in comfort until something more demanding turns up, at which point the car stiffens up, becomes more responsive and engages the driver a little more. All the modes are operated using a switch that falls naturally to the driver’s left hand and that forms part of Kia’s best interior to date. 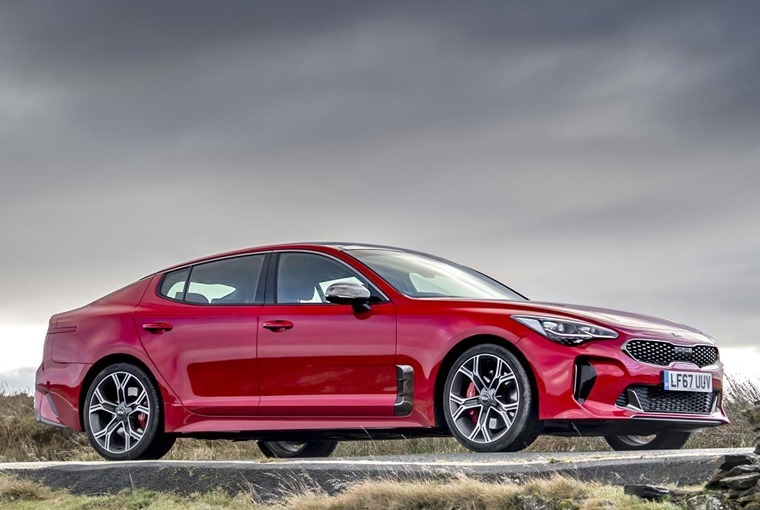 The plastics and perception of quality aren’t quite up there with BMW and Audi yet, but Kia’s on their way and the Stinger’s cabin is a fine example of simple, elegant design. It’s loaded with equipment; heated and cooled seats, a heated steering wheel, autonomous emergency braking, head-up display, Bluetooth connectivity, Android Auto, satellite navigation and just about everything else you can squeeze into a touchscreen. It’s practical too, thanks mostly to the length of the car. Those up front get looked after well while there’s more than enough leg and shoulder room in the back, although headroom does get tight as that sharply raked roof swoops down to the rear. The boot isn’t particularly spacious at 406 litres, but should suffice for a family trip. More mundane things like running costs might be a tad more extreme, with fuel economy barely scraping into the 30s, rear tyre replacement likely to be frequent, and company car tax bills hit with 37% BIK rating. However, there will be a less exciting choice of a 2.2-litre diesel or a 2.0-litre turbo petrol should the power and cost of the V6 prove to be too excessive, while residual values promise to be even stronger than those of its rivals, with average leasing costs coming in at around £500. 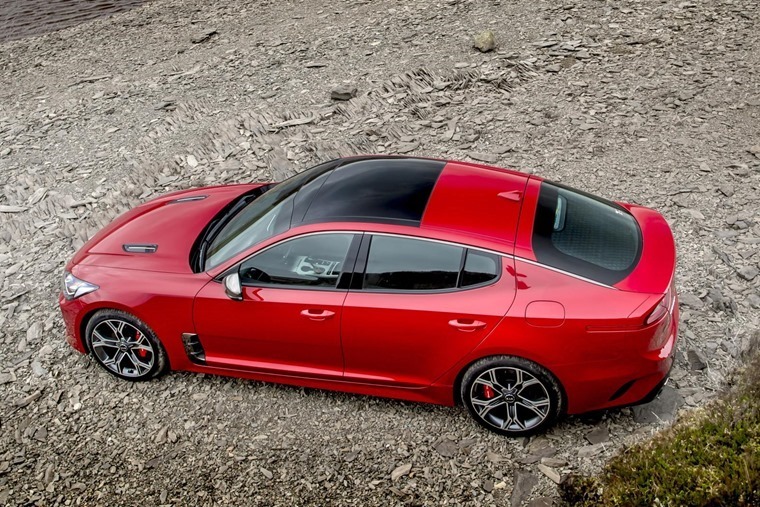 Essentially the Stinger is all the stuff you like about Kia, wrapped up in a package that’s genuinely exciting and looks a million bucks. 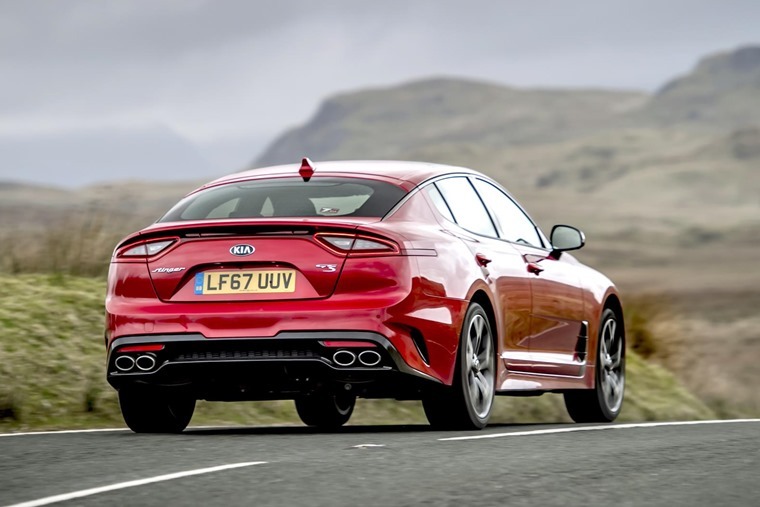 It can stand on its own four wheels as a viable rival to the likes of the BMW 4 Gran Coupe or Audi A5, rather than simply being seen as a good-value alternative – the fact that Kia is asking north of £40,000 for the car suggests there’s confidence in the offering. On my experience of the car, that confidence is well placed.